The former All-American quarterbacks from California have never played against each other, but meet Saturday when the Bruins visit Husky Stadium. 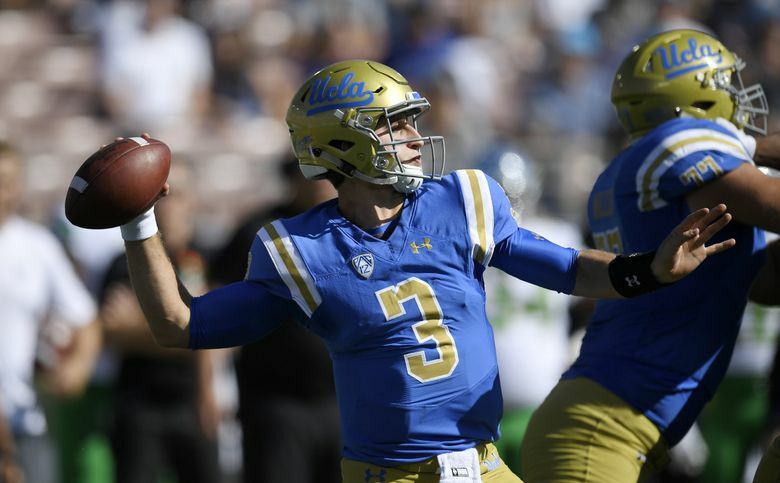 Pete Kwiatkowski, who is tasked with designing a defensive scheme that will slow down Josh Rosen on Saturday, doesn’t have to search very far to find someone who favorably compares to the UCLA quarterback. “Our guy is pretty similar,” the Washington Huskies defensive coordinator said while making the comparison between Jake Browning and Rosen. “It’s their accuracy and their football IQ where you find some of the same traits,” Kwiatkowski said. “They’re pro pocket guys, who are exceptional. The only difference would be Rosen probably has a stronger arm than Jake as far as getting the ball there a little bit quicker. Jake Haener won't read this for a reason. But will that help the UW Huskies QB win a starting job? The Browning vs. Rosen showdown at 12:30 p.m. Saturday at Husky Stadium on ABC/ESPN2 pits two of the Pac-12’s best passers in a matchup that’s as good as any in college football. Because Washington (6-1, 3-1 Pac-12) and UCLA (4-3, 2-2) didn’t play each other the past two seasons, it’s a quarterback confrontation that’s been building since their days when they reigned over California high school football in 2014. Browning was the NorCal record-setter who set the national prep career mark for touchdown passes with 229 at Folsom High. He compiled a 44-2 record as a starter, including a 16-0 record and a California Division I state championship. And Rosen, a SoCal standout who guided St. John Bosco High to a 16-0 mark and a CIF title as junior in 2013, became the No.1 quarterback prospect in 2014. Both were named to the 2014 USA Today first team All-USA and destined for stardom. Rosen, who grew up in Manhattan Beach, Calif., was a USC fan as a kid and had his heart set on attending Stanford. However, he never received a scholarship offer from the Cardinal and chose the Bruins who were in need of a quarterback to succeed Brett Hundley. In 2015, Rosen became the first true freshman to start an opener at UCLA. He threw for 3,668 yards, 23 touchdowns and 11 interceptions while leading UCLA to an 8-5 record. That year, Browning started 12 of 13 games while passing for 2,955 yards, 16 TDs and 10 interceptions for UW, which finished 7-6. 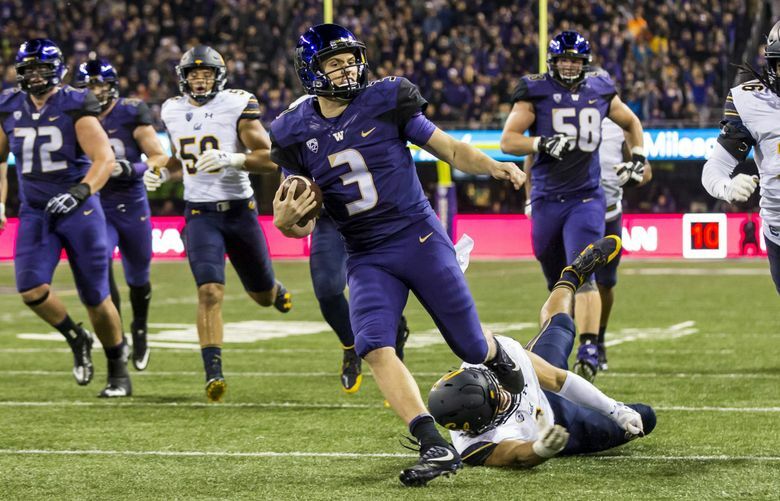 Their careers diverged in 2016 when Browning helped carry the Huskies to the College Football Playoff and a 12-2 campaign while tying the Pac-12 record for 43 touchdowns in a season and finishing sixth in the Heisman Trophy balloting. Meanwhile, Rosen topped 300 yards in four of first six games before a shoulder injury put him out for the season and UCLA spiraled to a 4-8 finish. This season, Rosen signaled his return with a dramatic 45-44 comeback win in the opener over Texas A&M on a play in which he faked a spike before throwing the winning touchdown pass after with 43 seconds left. His 2,620 yards is second nationally among FBS quarterbacks and he’s second in the Pac-12 behind Browning with a 148.2 quarterback rating. Browning is more interested in jump-starting a UW offense that stalled during a 13-7 loss at Arizona State two weeks ago. Still, he understands the pressure Rosen has lived with since he was tabbed with the moniker “Chosen Rosen” as a ballyhooed freshman. Rosen, who holds a 3.2 grade-point average and is on track to graduate with a degree in economics in three years, has sparked a handful of off-the-field controversies during his short tenure at UCLA. As a freshman, he installed an inflatable hot tub in his dorm room, which drew the ire of school officials who made him remove it and write an apology letter. After UCLA signed a $280 million apparel deal with Under Armour, Rosen posted on Instagram: “We’re still amateurs, though … Gotta love non-profits. #NCAA.” He later deleted the post. “There are guys who have no business being in school, but they’re here because this is the path to the NFL,” Rosen said in an interview with Bleacher Report. “There’s no other way. Then there’s the other side that says raise the SAT eligibility requirements. Over the past three years, UCLA coach Jim Mora has seen tremendous growth from Rosen on and off the field. “It’s what you would expect when you’re 17 years old and you come in and you’re the starting quarterback at UCLA,” Mora said. “That’s not an easy situation. That can be overwhelming. But the last couple of years he’s just progressed so much on the field as a player and around our team as a leader. Mora, a former Washington Husky defensive back and graduate assistant, has noticed Rosen has been a focal point for opposing defenses. “Just the human nature of it and the psychological part of it is when a guy is getting a lot of publicity and he’s highly ranked and he’s very successful, you might find a little more juice to compete against that guy,” Mora said. “I don’t think coaches necessarily like to hear that, but it’s probably accurate. Manhattan Beach, Calif. Hometown Folsom, Calif.